Talk about matching the iPhone 6’s design to the teeth! Moshi’s iGlaze case for the aforementioned smartphone dishes up a design that not only matches the phone’s design language, but it’s available in these pastel-like colors. If we’re to place the case side-by-side to the iPhone 6, in a profile view, it’s almost tough to distinguish the two apart because of their similarities. 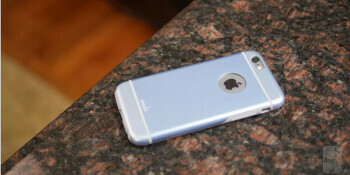 In fact, the Moshi iGlaze case’s minimalist design is a pleasant complement to the premium design of the phone. Specifically, this lightweight and durable case employs a hybrid construction that consists of a shock-absorbing inner-shell bonded to a shatter-proof polycarbonate outer casing. Our particular review unit, a two-toned blue color, has a pleasant color scheme that’s not too over-powering or flashy – so you can say that it’s more on the neutral side of things. Getting the _phone_ into place requires some force, due to the case’s form-fitting nature, but once it’s broken in more, we’re given an easier time putting it in/out of the case. Moshi paints the iGlaze case as being shock absorbing, which is it to an extent, but it’s not something that’ll safeguard it from serious falls. In all fairness, it’s simply the kind of case that protects it mainly from scratches and the usual bumps and bruises our phones are exposed to. Now, the only portion of the _phone_ that’s left exposed is the display. However, since it features raised bezels, we’re not worried about it scratching in the event it’s placed down on its screen – though, in our pockets, the screen is made exposed. Sporting a price point of $29.95, the Moshi iGlaze case for the Apple iPhone 6 is going to be the perfect fit for those handset owners who don’t want to take away from the phone’s iconic design. It’s a perfect complement as we’ve detailed. Just don’t expect it to be the kind of case that’ll safeguard the beloved phone from serious falls.